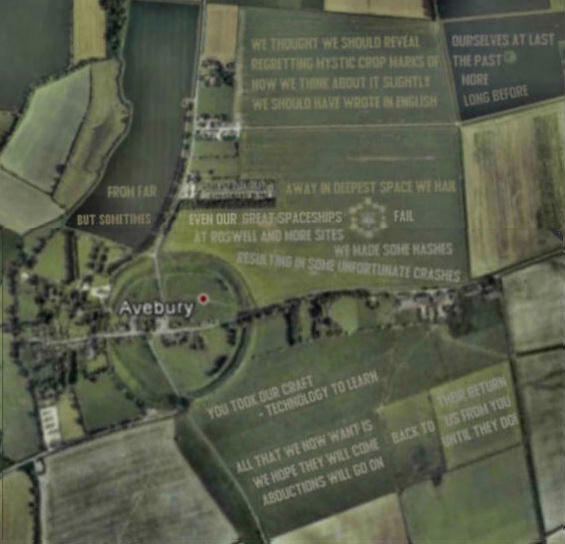 Scientists have confirmed that the astounding crop marks which appeared last night in England, near the Wiltshire village of Avebury, must have been made by a UFO. Uniquely, the markings are not geometric patterns, but, instead, form a poem, written in English. ABDUCTIONS WILL GO ON UNTIL THEY DO! The marks are quite unlike any previously known crop circle, explained a spokesperson for the Royal Institution. The corn has not been flattened, but apparently vapourised - scorching the earth beneath - but with no damage to the remaining crop that surrounds the letters. A statement from the British Air Force confirmed that radar and satellite data indicated that an unknown craft had hovered above Avebury for approximately five minutes, beginning at 02.03 am this morning. It had departed vertically, apparently attaining an instant velocity of 10,000 mile per hour. It had then left the Earths atmosphere. Tracking of the vehicle had been lost ten minutes later, however, as it passed the moon. I reckon that must have been one of them there extra-terrestrial spacecraft, all right, said Air Chief Marshal Sir Stephen Hillier, head of the RAF, in an unusually candid official response. Traditional UFO hunters and New Age believers, however, have turned their backs on the site in disgust, denouncing it as an obvious hoax. The controversy continues, while delighted farmers in Avebury say that income from visitors will now make hugely more money for them than their crops ever could have done.